Recently, I visited the Western Avenue Studios in Lowell, MA with my friend Suzanne. What a magical place it is. I had been wanting to visit the studios for quite some time, but I never imagined it was so enormous and filled with so many talented artists and artisans. In two hours, I barely got to check out the entire 3rd floor. 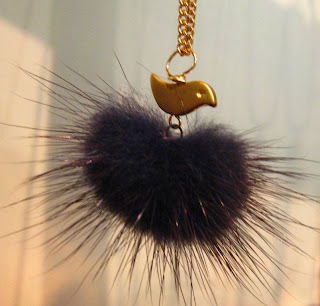 My first studio visit right out of the elevator on the 3rd floor was fellow BH'er Liz Stewart's Lush Beads. A magnificently stocked studio with all the supplies and tools anyone would need for beading and gorgeous finished pieces you can buy on the spot. 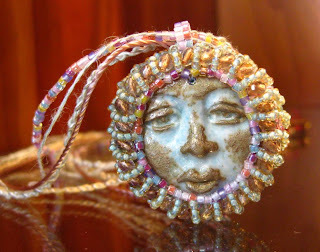 Having such a bountiful supply shop at her fingertips, Liz makes stunning art jewelry like the bezeled face pendant necklace pictured below. 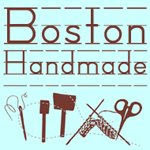 I was thrilled to see that Liz Smith of Made in Lowell was right across the hall, so that was my next stop. My friend bought one of these coffee cozys from Liz. These are so fun, colorful, and good for your carbon footprint, and they keep your hot coffee from burning your hands. I bought a felted nest ring. 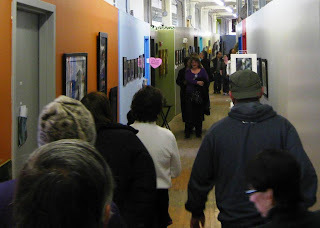 Roaming the halls, we entered almost every studio that was open on this very busy Saturday. 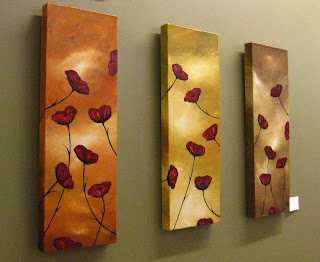 I love this tripdych of poppies outside of the Art by Verde studio. After a long two hours of browsing and talking with the artists, we moseyed our way down to the second floor where we heard there was a cafe. Outside of the cafe, I found Walk on the Moon. 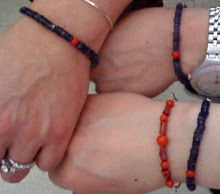 Really fun jewelry, and a wonderfully inspiring woman. Regina was a treat to meet, plus, I've bought some stuff from her in the past from her destash shop on etsy, Run on the Sun. And she's bought from me, too. There are more visits in my future to the Western Avenue Studios. There is no way anyone can absorb all that is to see in one day. I look forward to my return. It's such an inspiring place. Wow! So glad you made it to Lowell. you are right: it's way to big now to see it all in one visit. I think one's head would explode. 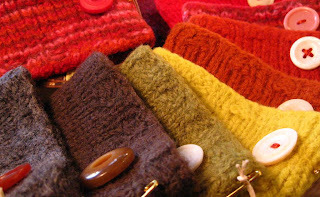 Next time you come, start on the fifth floor and visit me at Lowell Fiber Studio. Drifting down the stairs is at least easier than climbing up! Hey Nanners-I sent you some Sunshine today on my blog. No pressure, just a little fun on a cold winter day.